Why is ‘being happy’ such an imperative nowadays? What meaning do people give happiness? 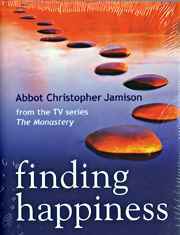 In this book Abbot Christopher turns to monastic wisdom to offer answers, and to explain that in essence, happiness is a gift not an achievement, the fruit of giving and receiving blessings. Following the same accessible and engaging format of Finding Sanctuary, Abbot Christopher takes different aspects of happiness, examines them, tells us what monastic wisdom has to say about them, and offers us steps towards our own journey to finding happiness.